After a long time, I found myself reading a novel by an NRI. I have admired Chitra Banerjee Divakaruni's work for a long time, specially during the years when I was an NRI myself and developed an interest in writing. I have read most of her novels and am a great fan of her poetic style of narration. Like all authors, she has figured out a formula that works and keeps churning out novels that are interesting, on seemingly diverse topics while keeping the core theme common. 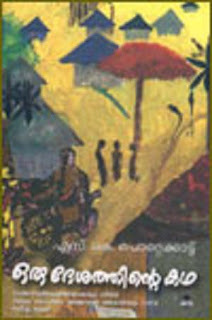 Her earlier novels like Mistress of Spices and even the more contemporary ones like Sister of My Heart and Vine of Desire, have a magic realism element where the unexplained old traditions of the old country (India) lie side by side with up-to-date descriptions of freeways and bridges of the United States. Queen of Dreams reads a lot like Mistress of Spices, right from the title itself which to me sounded uncannily similar. But true to the formula, the story begins deceptively as the life of painter and single-mother Rakhi who also co-owns Chai House, a eatery in Berkeley, California with her Sikh friend, Belle. The monotonous life of American-born daughter of immigrant Bengali parents who refuse to talk about their country of origin would have been a dreadful bore if Rakhi's mother had not been a "dream teller". A novel concept of people who have the gift of dreaming the dreams of others and can be trained by cult of women is brought into the narrative through the dream journals kept by Rakhi's mother who has this gift. Rakhi's father appears to be a bystander, largely ignorant of this part of his wife's life and only an incidental character in Rakhi's formative years when her mother's mysterious aura captivates her completely. Jona, Rakhi's little daughter and Sonny the ex-husband play important roles which are lovingly described in the chapters. Rakhi's ambivalence towards the relationship shared by her ex-husband and child, the fascination for India, the mysterious country that is not spoken about, the frustration of dealing with the creative dry spell in her paintings and the competition small neighborhood businesses face from large faceless corporations are dealt with finesse. The writing is beautiful. Some of the prose reads like poetry, Banerjee liberally uses similes and metaphors that say a thousand words. Some examples that stayed with me were "Inside me the thoughts I have been battling wait like submerged rocks in a river", "When I opened my eyes, the house was in front of me, like a woman kneeling with her arms open." For the most part, the story moves a tad too slowly. After a fatal road accident, while translating the dream journals from her native Bengali, Rakhi's father starts bonding with Rakhi as they both discover the secrets of the woman who was a central but aloof presence in their life. It is Rakhi's father who helps her find the elusive recipe for making her eatery a success and deal with the aftermath of the attack on the World Trade Center that affects all non-white immigrants in America. The book is an interesting read, written predominantly for a westernized audience, with liberal doses of mystical masalas that are implied as being part of the lives of Indians in India; a cocktail of flavors that always satisfies its hungry audience of readers, both resident and non-resident Indians. Must be an enjoyable read Queen of Dreams by Chitra Banerjee Divakaruni. loved the way you wrote it. I find your review very genuine and orignal, this book is going in by "to read" list.